Wisdom Panel Reviews - Find Your Dog's True DNA History? Finding out your dog’s breed history and his or her propensity for certain health conditions is as easy as ever with Wisdom Panel, a DNA testing service that can provide results in as little as two weeks. Wisdom Panel Review: Find Your Dog's True DNA History? 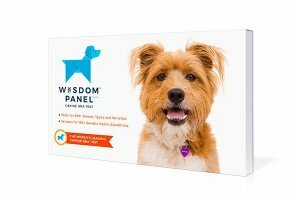 Wisdom Panel is a dog DNA test kit through which you swab your pup’s mouth, send the sample to Wisdom Panel and get a comprehensive DNA report focusing on your dog’s ancestry, breeds and/or health. The company has tested the DNA of more than 1 million dogs, their website claims, making them the premier dog DNA testing service available. In this review, we will give you our analysis of how this dog DNA service works, what it costs and how it compares to Embark and Home DNA, two similar services. The core of Wisdom Panel’s service is their DNA testing kit. They send you swabs that you’ll swipe across the inside of your pup’s cheek. Once you do the swab, you can send it back to Wisdom Panel via a prepaid shipping package. At that time, you’ll want to “activate” your kit by clicking the light-blue “Activate Kit” button on the Wisdom Panel home page. Doing this gives you access to the site’s Learning Lab, a portal through which you can track the progress of your dog’s DNA sample. Also, you can take fun quizzes about dog breeds. According to Wisdom Health, it will take about two to three weeks for them to process the DNA. Their analysis of your canine’s DNA is pretty extensive. They compare it to nearly 2,000 genetic markers and 15,000 breed samples. They use this data to construct more than 17 million family trees, then pare those results down to the 11 most likely. From those 11, they choose the most likely tree that explains your dog’s family history. The company says their tests are able to cross-reference your dog’s DNA with 15,000 DNA samples from more than 350 breeds, thereby providing you with your dog’s breed mix. 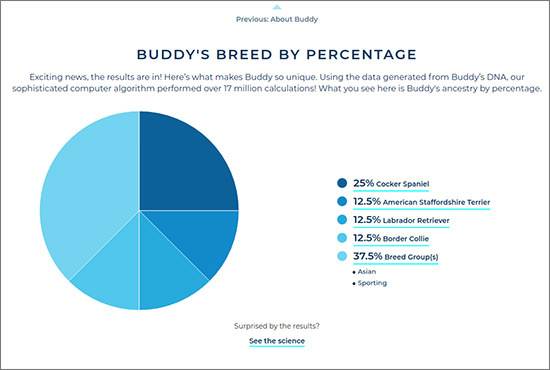 Wisdom Panel provided a sample report that we looked through to get a sense of the kind of information you’ll get as the result of your dog’s DNA test. Once you move past this page, you get in-depth explanations of each type of breed that Wisdom Panel identified in your pup’s DNA. Each breed breakdown includes photos of the breed; personality traits; average height and weight; tips for living with them and a brief history of the breed. The ancestry tree part of the results provides a clean, simple view of both sides of your dog’s family going back three generations. Remember, these are Wisdom Panel’s best guesses based on more than 17 million different family tree possibilities narrowed down to the one they think of most likely. The next main section of analysis is health. As we’ll point out in a few minutes, a report with a basic health analysis is cheaper than a report with more than an analysis of more than 150 possible mutations that could lead to sickness. The following description of a sample health section is what you’d get with the more expensive package. In the sample report we viewed, the first part of the health review included three levels of mutation categories: risk, carrier and clear. Risk indicates your dog has inherited two copies of a mutation, which means there’s a chance they could get a certain type of sickness. Carriers get one copy of a mutation, which means that your dog “is unlikely to show disease signs,” the site notes. The final category -- “Clear” -- means your dog isn’t carrying any of the disease-causing mutations they analyze. This section of the report also includes a “traits” page which highlights parts of your dog’s body and explains how genetics plays a role in the way he/she looks. For example, the results we looked at had seven different regions highlighted on a fictional dog’s body. One of those regions related to coat length and type. “Buddy’s coat is probably on the short side...Did you know some genes can even change how short a coat looks, including adding ‘feathering’, which results in longer hairs behind the ears, under the belly, and behind the legs,” the explanation noted. If you choose to go with the cheaper DNA test, then the two mutation analyses you’ll get are the MDR1 and exercise-induced collapse (EIC) genes. Both are helpful, as dogs with the MDR1 mutation can have more sensitive reactions to certain drugs and those with the EIC mutation tend to be Labrador retrievers. At the time of publishing, the site was offering a $15 discount. Wisdom Health makes it clear that their tests aren’t testing whether or not your dog is a certain breed. Rather, they match your dog to breeds that have a gene profile most similar to your dog’s. If you have any questions about your report, you can contact Wisdom Health at 888-597-3883. We wanted to know how expensive other DNA dog tests were as well as how extensive their testing data was, so we went to popular pet supply site Chewy and reviewed pricing and features for two Embark and DNA My Dog. Based on our research, we believe that Wisdom Panel provides the best value for those who want to get the most extensive information possible for their dog’s breed profile as they can test for around 100 more breeds than Embark and around 250 more than DNA My Dog. Embark’s genetic mutation screening is the most extensive because it analyzes about 25 more possible mutations than Wisdom Panel and around 75 more than DNA My Dog. Another thing that we want to point out is that Embar has the simplest pricing model – everything is included in the single price they offer. Wisdom Panel is only slightly more complicated than Embark because it offers two pricing tiers instead of one. However, that “complication” is actually good, in our opinion, because it gives you two options. If you don’t want to know your dog’s gene mutations, then you can pay $84.99 instead of $149.99 but complicated in a way that could benefit you. If you just want to know your dog’s breed history and breed family tree but don’t care for the health screening, then having a cheaper price point makes Wisdom Panel a good fit. DNA My Dog has a far more complex pricing structure. You can choose between a breed test ($68.99), a breed test that includes testing for links to wolf breeds ($89.99), a breed test that also includes an age test ($99.99), a limited health screening ($31 extra) or a full health screening ($120) extra. The two health screenings are cheaper if you order them along with a breed test. As for customer reviews, Embark is the superior product because it has a significant advantage over its two competitors. Common phrases among more than 678 reviews were, “highly recommended,” “well worth,” “peace of mind” and “worth the money. The 45 people who reviewed Wisdom Panel at the time of publishing used the phrase “easy to use” frequently in their reviews. Recent reviews of the test were dominated by positive reviews, with a couple of people complaining that they didn’t like the breed mix Wisdom Panel provided. In general, we believe the Embark and Wisdom Panel are the top choices, with Wisdom Panel edging ahead because of how extensive their breed test is and because they are the more affordable option of the two. Our research of this service, as well as our comparison of this one to others like it, has given us a pretty clear picture of what Wisdom Panel’s strengths and weaknesses are. First, we believe that the pricing for this service is excellent because it gives you the option of doing a breed test on your dog or a breed and health test. Embark, on the other hand, only has one pricing tier that reflects both a breed and a health test. Also, we enjoyed the way that Wisdom Panel presented their DNA findings. The format was visually interesting and simple enough not to be overwhelming. We found it to be an educational experience that could benefit dog owners both in their curiosity about their dog’s breed background as well as his or her personality traits and, if you choose it, a wealth of information about your dog’s probably of getting certain diseases or conditions. The main downside to the test, in our opinion, is that Embark’s Amazon reviews are noticeably better than Wisdom Panel’s. While it’s hard to say exactly what the defining difference is between the two services in terms of customer satisfaction, we do know that, on average, Amazon customers are happier with Embark than with Wisdom Panel. What’s important to keep in mind, though, is that both services seem to be above average when it comes to customer reviews. So, if you’re on the fence about the two and you’re worried about price, we’d say that choosing Wisdom Panel to save yourself money isn’t a bad decision. Write a Review for Wisdom Panel!